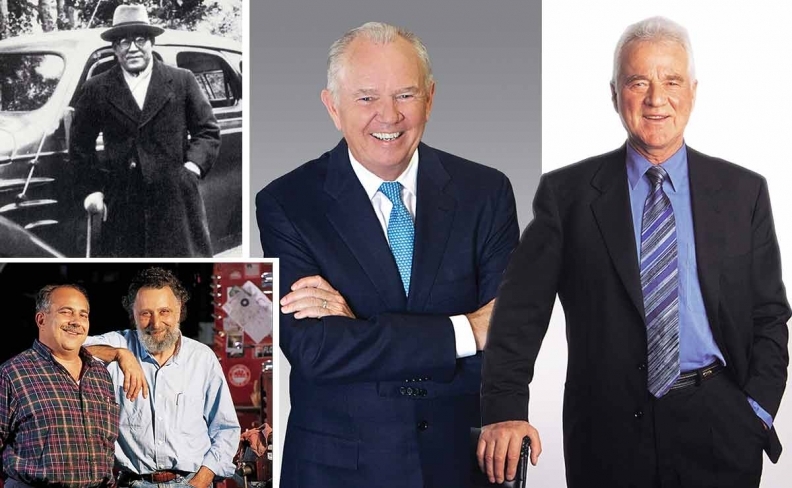 Automotive Hall of Fame inductees, clockwise from top left: Toyota's Kiichiro Toyoda, AutoNation's Mike Jackson, Magna's Frank Stronach and Car Talk's Ray and Tom Magliozzi. Frank Stronach, founder of supplier giant Magna International will be inducted into the Automotive Hall of Fame in Dearborn, Mich., in July. "His innovation in creating a unique corporate culture and compensation system, driving competition and excellence, has changed the global landscape of the automotive supply base," a statement announcing the inductees said. Mike Jackson, who in his nearly two-decade tenure leading AutoNation Inc. has grown it into the largest new-vehicle dealership group in the United States, will also be inducted. The other inductees this year will be Kiichiro Toyoda, who launched what became Toyota Motor Corp., and Ray and Tom Magliozzi, co-hosts of the National Public Radio weekly show "Car Talk." They will be inducted during a ceremony at the MGM Grand Detroit on July 19. Throughout Jackson's 19-year span with AutoNation, the retailer has sold nearly 12 million vehicles. The group owns 274 new-vehicle dealerships nationwide. "I am honored that I'm joining our founder Wayne [Huizenga], saddened that he won't be there to share the moment," Jackson told Automotive News. "Wayne was one of the great mentors in my career, a transformational mentor. The other one is Dieter Zetsche [Mercedes-Benz and Daimler CEO]. You could not have two individuals who were more giving of their time, energy, expertise, thoughtfulness and guidance to make me a better executive." The percentage of retailers in the Automotive Hall of Fame is relatively small, Jackson said. "To have known Jim Moran [of JM Family Enterprises] and Wayne Huizenga personally… I know the type of entrepreneurial energy they needed to make it," he said, adding that he is also proud to be in the Hall of Fame with Roger Penske, whom he calls "a great retailer." To cope with shrinking new-vehicle margins, AutoNation five years ago began to use the AutoNation name on all of its new-vehicle stores except those that sell luxury cars. In 2016, Jackson built on that brand recognition with a brand-extension strategy that included AutoNation-branded auctions, used-car outlets and collision centers, and branded parts, accessories, and finance and insurance products. AutoNation began as a used-car retailer, but branched into new-vehicle sales before Jackson arrived. His brand-extension strategy therefore is taking the company back into used cars, as well as other businesses. As dealerships battle a new-vehicle sales decline and tightening margins, many have become dependent on manufacturers' stair-step incentive programs. "That's why we innovated in other areas," he told Automotive News last year. "I really believe that we have reached the point where scale and brand in auto retail is a significant competitive advantage." Under Jackson's leadership, AutoNation also aimed its charitable contributions toward breast cancer research, a campaign the company has named Drive Pink. "Without a brand umbrella, I'm not sure we could have done all that from coast to coast and unified 27,000 employees around this singular effort," Jackson, 69, said. AutoNation has generated more than US$12 million for cancer research centers. Before taking the helm of the Fort Lauderdale dealership group, Jackson was president of Mercedes-Benz USA. He was also named chairman of the Federal Reserve Bank of Atlanta in January. Toyoda, who died in 1952 at age 57, was president of Toyota Motor Corp. from 1941 to 1950. He was the son of Sakichi Toyoda, who started the Toyoda companies with the invention of a loom that automatically stopped when a thread broke. Sakichi Toyoda's company, Toyoda Automatic Loom Works Ltd., is now known as Toyota Industries Corp.
Kiichiro Toyoda expanded the company, founding an automotive division within Toyoda Automatic Loom Works in 1933. That division eventually became Toyota Motor Corp. Both Kiichiro's son, Shoichiro Toyoda, and his cousin, Eiji Toyoda, have been inducted into the Automotive Hall of Fame. The Magliozzi brothers -- also known as "Click and Clack, the Tappet Brothers" -- were the co-hosts of NPR's national weekly radio show, "Car Talk," which was produced from 1977 until 2012. The show, featuring their irreverent responses to callers with car problems or questions, continues to be distributed in syndication. Tom Magliozzi died in 2014 at age 77. In 1973, the brothers opened Hacker's Haven, a do-it-yourself repair shop that rented space and equipment for drivers trying to fix their own cars. Four years later, the Magliozzis were invited to be part of a panel of automotive experts for a talk show on WBUR-FM, NPR's Boston member station. "Car Talk" debuted as an independent NPR program in 1987. In 1992, the two brothers won a Peabody Award for the show for "distinguished achievement and meritorious public service," the statement said.